When the King County Superior Court’s court records system switched from Washington State’s legacy SCOMIS system to the King-County-only JAMS system, the switch effectively terminated all new King County case data from being entered into the statewide SCOMIS Names Index. 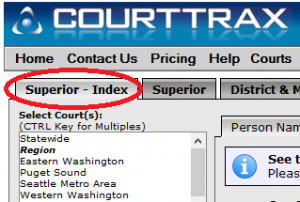 CourtTrax provides access to this Names Index using the Superior – Index tab on the Washington State search form. The Washington State Superior Court (SCOMIS) Index, is a statewide database of names and case numbers, updated on a weekly basis, for the Washington State Superior Court System. CourtTrax offers the SCOMIS Index as a faster, more affordable solution when conducting multi-county Name Searches in Washington State. With King County no longer adding data to the SCOMIS Index database, it resulted in a significant loss of information both to our users, and the public at large. To resolve this name/case information gap, CourtTrax created and now includes a live search of the JAMS system with any query of the SCOMIS Index that includes King County. Our users now can be assured they are getting as complete picture as is possible of Superior Court case activity in Washington State when using the Index. This enhancement does not involve any increase in cost to our customers for an Index search. The Washington State Administrative Office of the Courts tells us that their solution for updating the SCOMIS Index with the JAMS system data is in the works, but likely will not be available until sometime in 2019. Until then, the CourtTrax Hybrid Index solution is available. If you have any questions about our Hybrid Index solution, the SCOMIS Index, King County JAMS, or would like information about any of our other products and services, contact us at customerservice@courttrax.com or give us a call: 866-643-7084 (Option 2).